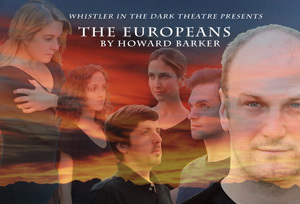 Whistler in the Dark Theatre returns to the Factory Theatre with Howard Barker’s "The Europeans," an emotional shockwave of a play that's both a harrowing love story and an exploration of personal freedoms and choices inside the political structures that control our lives. With performances scheduled for February 10 - 26, the production is intended for mature audiences. In the aftermath of the siege of Vienna, the Emperor and his subjects begin to build the city anew. But when they are faced with the challenge of building a society from the ground up, which aspects of history should be honored, and which can be cast aside or re-invented? Out of the play’s historical backdrop emerges the story of an unlikely couple struggling to come together, a priest re-inventing God, and the powerful needs of the State fighting against the individuals who comprise it. "The Europeans" marks Whistler in the Dark’s fourth exploration of Howard Barker, a playwright whose works and ideas have been integral in shaping the company’s mission and aesthetic. During its first five seasons, Whistler has presented 11 full-length plays, and sponsored three years of FeverFest, a festival devoted to providing opportunities to connect exploratory artists with adventurous audiences by creating an outlet for innovative, cutting-edge, and contemporary performance in the Greater Boston area. The company received an Elliot Norton Award nomination for its production of Howard Barker's "The Possibilities." For tickets, call 1-800-838-3006 or visit www.whistlerinthedark.com. The box office at The Factory Theatre, located at 791 Tremont Street in Boston, will be open one hour prior to performances.